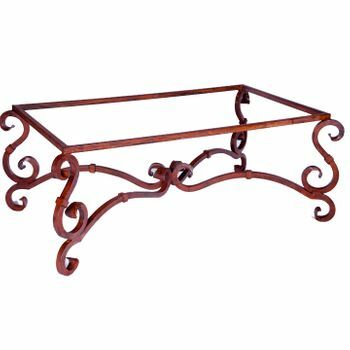 The wrought iron tables shown in this section are sold as a base only - the top is not included. Why do we do that? Because a beautiful base allows you to use a top you currently own or change up your style without a hefty price tag for total replacement. All our bases can buttress glass, wood or copper, and unlike wood bases, many can handle marble - and even, granite - table tops. Why is that important? Because standard industry measurements suggest that at least one third, and preferably one half, of the table top selected be fully supported by the base beneath it. The vast selection of strong, sturdy design options offered ensures balanced weight even under a large piece of stone. 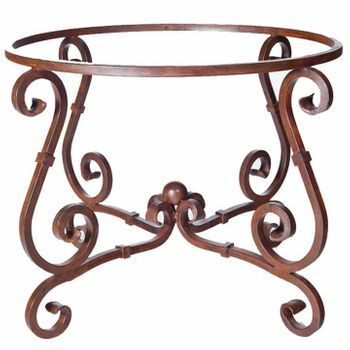 At Iron Accents we've gone to great lengths to feature table bases that work in multiples - coordinating end, side and dining table bases for example - and with any decor. 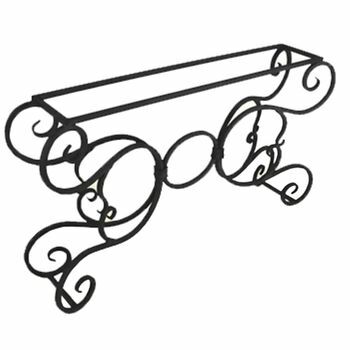 Our wrought iron selection includes fanciful scrolls, nature inspired embellished legs, rustic and cabin styles, clean-lined linear metal supports and carved wood pedestals. 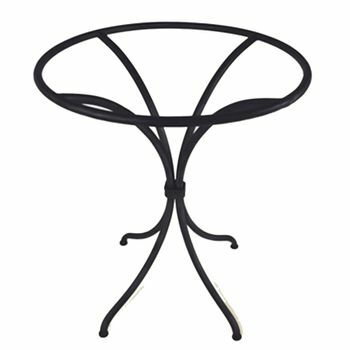 And we specialize in the hard to find ... ice cream or cafe table bases, supports for oval tops and slender consoles. Tell us what's on your mind. We'll help you "build" a table you can brag about for years to come. When searching for the ideal size and type table base bear a few things in mind. Granite and marble table top slabs are typically 2 centimeters or 3/4 of an inch thick. Two centimeters equates to thirteen pounds per square foot. 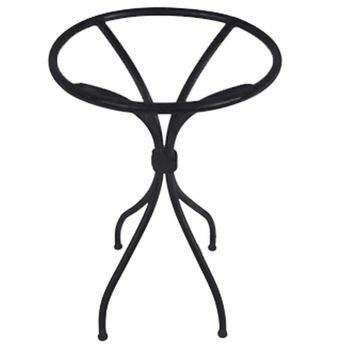 This no time for a delicate table base that could tip over when in use! Taller tables display the same tendencies when topped with heavy natural materials. Look for bases with multiple load bearing points rather than a single column. 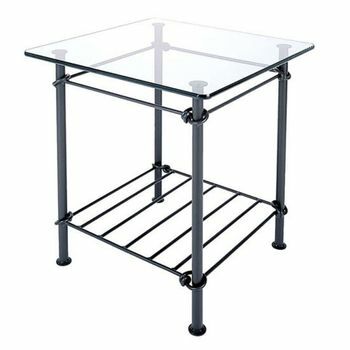 Weight distribution is critical to the stability of any table top and reduces the chance of flexing under a table surrounded by guests at a Thanksgiving meal! Ask our design experts if your table base and top should be attached using a sub-strata material such as plywood or MDF. This process is often recommended for certain heavier table top substances - like granite and marble - to fully connect the table top and base without damaging or weakening the stone. We want you to be completely satisfied with your table base selection so feel free to ask us about our previous customer care experiences and best practices. Click Here to view our table top collection.